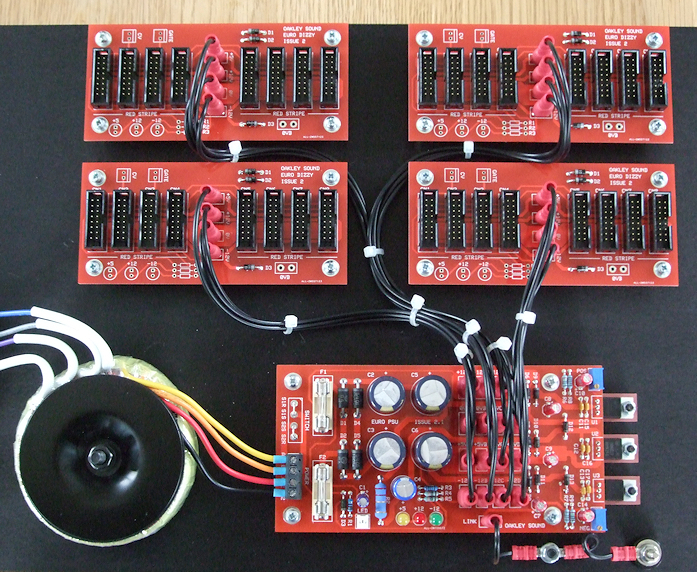 This is a power distribution board supporting eight 16-way IDC headers and four faston headers for power entry. Also present are two 0.1" headers that connect to the CV and gate bus and three LED power ready indicators. The 2oz copper double sided circuit board is 5.6" (142mm) long by 2.35" (60mm) wide. 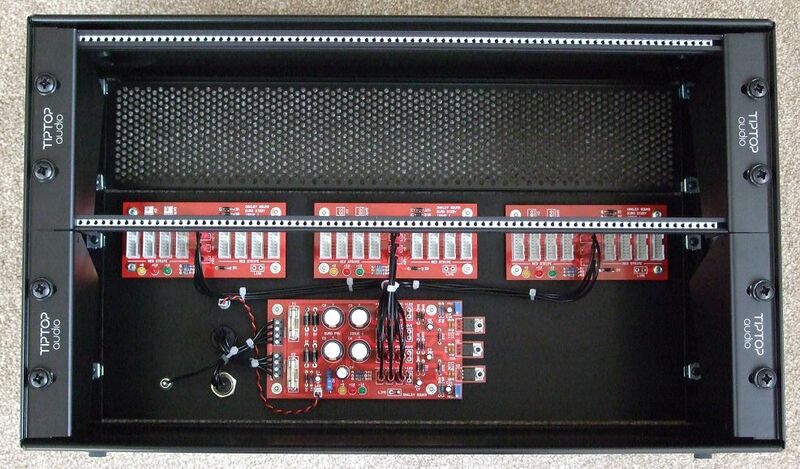 It is designed to go at the rear of 19" rack units or built into the bottom panel of wooden modular cases. An optional grounding point is also available which can connect 0V to the bottom right mounting hole. The Oakley Euro PSU being used to power three Euro Dizzy boards. Please note this is a bare printed circuit board and does not come with any components fitted. All other parts can be purchased from your usual electronic component supplier. Fully populated Euro Dizzy boards may be available from Krisp1.com. Three Euro Dizzy boards powered from one Oakley Euro PSU fitted to a 4U high aluminium 19" rear mounted panel in a 6U high rack case from All Metal Parts. Module mounting rails and rack ends from Tip Top Audio. Last revised: November 02, 2016.